The Court of Appeals, sitting in Albany and consisting of seven judges, is the state's highest court. The Appellate Division of the New York State Supreme Court is the principal intermediate appellate court. The New York State Supreme Court is the trial court of general jurisdiction in civil cases statewide and in criminal cases in New York City. Outside New York City, the 57 individual County Courts hear felony criminal cases. There are a number of local courts in different parts of the state, including the New York City Civil Court and New York City Criminal Court. The system is administered by the Chief Judge of the State of New York, working with the Chief Administrative Judge, other administrative judges, the Office of Court Administration, and other agencies. In general, the judicial system is composed of the appellate courts and the trial courts, consisting of the superior courts and the local courts. There are also other tribunals that are not normally considered part of the New York State Unified Court System or the judiciary proper. The New York State Court of Appeals is the state's highest court. In civil cases, appeals are taken almost exclusively from decisions of the Appellate Divisions. In criminal cases, depending on the type of case and the part of the state in which it arose, appeals can be heard from decisions of the Appellate Division, the Appellate Term, and the County Court. The New York Supreme Court, Appellate Division is the state's second-highest court, and is regionally divided into four judicial departments. It primarily hears appeals from the superior courts in civil cases, the Supreme Court in criminal cases, and the County Court in felony criminal cases in the Third and Fourth Judicial Departments. In addition, in civil cases it may hear appeals from the appellate terms of the Supreme Court when these courts have heard appeals from one of the lower trial courts. The court of general jurisdiction in New York is the New York Supreme Court. (Unlike in most other states, the Supreme Court is a trial court and is not the highest court in the state.) There is a branch of the New York Supreme Court in each of New York State's 62 counties. In New York City, the Supreme Court in each county hears all felony cases; outside New York City, these cases are generally heard in the County Court. The Supreme Court hears civil cases seeking money damages that exceed the monetary limits of the local courts' jurisdiction. The Supreme Court has exclusive jurisdiction over most cases in which a party seeks equitable relief such as an injunction, declaratory judgment actions, or proceedings for review of many administrative-agency rulings. The court also has exclusive jurisdiction over matrimonial actions seeking a divorce, legal separation, or annulment of a marriage. In several counties the Supreme Court has a specialized Commercial Division that hears commercial cases. The New York State County Court operates in each county except for the five counties of New York City (in those counties, the Civil Court, Criminal Court and Supreme Court operate in place of a typical County Court). In many counties, this court primarily hears criminal cases (whereas the Supreme Court primarily hears civil cases), and usually only felonies as lesser crimes are handled by local courts. The Family Court has exclusive jurisdiction over certain matters involving minors, including juvenile delinquency charges, status offenses, child abuse and neglect, termination of parental rights, adoption, and guardianships. It also handles aspects of domestic relations disputes including child support and child custody (although only the Supreme Court can grant a divorce). The Surrogate's Court exercises exclusive jurisdiction over probate and related matters, and also has jurisdiction over certain guardianship matters (concurrent with the Supreme Court) and over adoption proceedings (concurrent with the Family Court). The Court of Claims hears actions seeking monetary damages against the State of New York itself. The judges are appointed by the Governor subject to confirmation by the State Senate. City courts handle the arraignment of felonies, try misdemeanors and lesser offenses, and try civil lawsuits involving claims of up to $15,000. 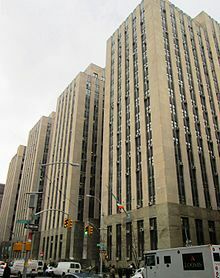 The New York City Criminal Court and the New York City Civil Court are the local courts in the 5 boroughs of New York City. Some city courts have small claims parts for the informal disposition of matters involving claims of up to $5,000 and/or housing parts to handle landlord-tenant matters and housing violations. The District Court is the local criminal and civil court in Nassau County and the five western towns of Suffolk County. It arraigns felonies and tries misdemeanors and lesser offenses, as well as civil lawsuits involving claims of up to $15,000, small claims and small commercial claims up to $5000, and landlord-tenant actions. Justice courts (town and village courts) try misdemeanors and lesser offenses in towns and villages. These courts are the starting point for all criminal cases outside cities, and handle a variety of other matters including small claims, traffic ticket cases and local zoning matters. They also arraign defendants accused of felonies. These courts may hear civil lawsuits involving claims of up to $3,000 (including small claims cases of up to $3,000). Unlike all other courts which are state-funded, the town and village justice courts are locally funded. There are numerous administrative courts which are not considered part of the judicial branch of government. The Traffic Violations Bureau (TVB) is a part of the state Department of Motor Vehicles that adjudicates non-criminal traffic violations (other than parking violations) in New York City. The New York City Office of Administrative Trials and Hearings (OATH) is an agency of the New York city government that conducts administrative hearings, overseeing the operations of four tribunals: the OATH Tribunal, the Environmental Control Board, the Health Tribunal, and the Taxi & Limousine Tribunal. The New York Court for the Trial of Impeachments, often referred to as the Impeachment Court or sometimes as the High Court of Impeachment, is for the trial of state officers who had been impeached by the State Assembly. Decisions of the New York Court of Appeals are binding authority on all other courts, and persuasive authority for itself in later cases. Decisions of the New York Supreme Court, Appellate Division department panels are binding on the lower courts in that department, and also on lower courts in other departments unless there is contrary authority from the Appellate Division of that department. Decisions by the Supreme Court, Appellate Term must be followed by courts whose appeals lie to it. Published trial court decisions are persuasive authority for all other courts in the state. The Civil Practice Law and Rules (CPLR) governs legal procedure such as jurisdiction, venue, and pleadings, as well certain areas of substantive law such as the statute of limitations and joint and several liability. The Judiciary of New York is a unified state court system that functions under the Chief Judge of the New York Court of Appeals who is the ex officio Chief Judge of New York. The Chief Judge supervises the seven-judge Court of Appeals and is chair of the Administrative Board of the Courts. In addition, the Chief Judge establishes standards and administrative policies after consultation with the Administrative Board and approval by the Court of Appeals. The Administrative Board is composed of the chief judge and presiding justices of each Supreme Court Appellate Division department. The Chief Administrator (or Chief Administrative Judge if a judge) is appointed by the Chief Judge with the advice and consent of the Administrative Board and oversees the administration and operation of the court system, assisted by the Office of Court Administration. The Judicial Conference of the State of New York is responsible for surveying current practice in the administration of the state's courts, compiling statistics, and suggesting legislation and regulations. 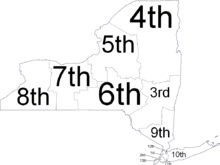 The court system is currently divided into thirteen judicial districts: seven upstate districts each comprising between five and eleven counties, five districts corresponding to the boroughs or counties of New York City, and one district on Long Island. In each judicial district outside New York City, an Administrator (or Administrative Judge if a judge) is responsible for supervising all courts and agencies, while inside New York City an Administrator (or Administrative Judge) supervises each major court. Administrators are assisted by Supervising Judges who are responsible in the on-site management of the trial courts, including court caseloads, personnel, and budget administration, and each manage a particular type of court within a county or judicial district. District Executives (outside New York City) and Chief Clerks (inside New York City) assist the local administrators in carrying out their responsibilities for supervising the day-to-day operations of the trial courts. The district administrative offices are responsible for personnel, purchasing, budgets, revenue, computer automation, court interpreters, court security, and case management. Many counties use the New York State Courts Electronic Filing System for electronic court filing (e-filing, like the federal PACER system). The New York State Reporter of the New York State Law Reporting Bureau is the official reporter of decisions and is required to publish every opinion, memorandum, and motion sent to it by the Court of Appeals and the Appellate Divisions of the Supreme Court in the New York Reports and Appellate Division Reports, respectively. The appellate term and trial court opinions are published selectively in the Miscellaneous Reports. The State Reporter is appointed by the Court of Appeals. The current versions are the New York Reports 3d (cited as N.Y.3d), the Appellate Division Reports 3d (cited as A.D.3d) and the Miscellaneous Reports 3d (cited as Misc.3d). All courts, except justice courts (town and village courts), are financed by the state in a single court budget. During 2009, the judiciary had approximately 1300 judges, 4.6 million new cases, and a budget in excess of $2.5 billion. Currently it has a $2 billion budget, 3,600 state and locally paid judges and over 15,000 nonjudicial employees in over 300 locations around the state. There are several officers of the court, including judges, jurors, and bailiffs. Judges of the Court of Appeals are appointed by the Governor with the advice and consent of Senate upon recommendation of the Commission on Judicial Nomination. Judges of the Court of Claims are appointed in the same manner, without the requirement of a commission recommendation. All other justices are elected, with the exception of those of the New York City Criminal Courts, New York City Family Court, and some other city courts, which are appointed by the mayor. Supreme Court justices are nominated by judicial district nominating conventions (with judicial delegates themselves elected from assembly districts), while New York City Civil Court and Surrogate's Court judges are nominated in primary elections. Family Court judges serve 10-year terms; those outside New York City are elected, while those in New York City are appointed to by the Mayor. Surrogates serve 14-year terms within New York City and 10-year terms elsewhere in the state. Full-time city court judges serve 10-year terms, and part-time city court judges serve six-year terms. District Court judges are elected to six-year terms. Justice court justices are elected to four-year terms. The majority of justice court justices are not attorneys, and non-attorney justices must successfully complete a certification course and participate in continuing judicial education. New York City Criminal Court judges are appointed by the Mayor of New York City to 10-year terms from a list of candidates submitted by the Mayor's Advisory Committee on the Judiciary. New York City Civil Court judges are elected from districts to 10-year terms, with vacancies filled by the mayor and service continuing until the last day of December after next election, while Housing Part judges are appointed by the Chief Administrative Judge to five-year terms. Once a judge is elected or appointed, the Chief Judge, in consultation with the Chief Administrative Judge, Administrative Judges, Supervising Judges and the Presiding Justice of the relevant Appellate Division, assigns judges to a court and a part, not necessarily the court and county in which they were elected or appointed, including to the Supreme Court (but not its Appellate Division or Appellate Term) as Acting Supreme Court Judges. Judges are regulated by the Rules Governing Judicial Conduct promulgated by the Chief Administrative Judge, the Code of Judicial Conduct adopted by the New York State Bar Association, and the relevant rules of the respective Appellate Division departments. The eleven-member New York State Commission on Judicial Conduct receives complaints, investigates, and makes initial determinations regarding judicial conduct and may recommend admonition, censure, or removal from office to the Chief Judge and Court of Appeals. The Ethics Commission for the Unified Court System administers financial disclosure requirements. The New York State Advisory Committee on Judicial Ethics issues confidential advisory opinions regarding judicial conduct. Along with the unusual names for the courts, judges in the Supreme Court and the justice courts are called justices, while in the Court of Appeals and in other courts such as the Family Court, County Court, and Surrogates' courts, they are called judges. The Judiciary Law states that all litigants (who have the right to a jury trial) have the right to juries selected from a fair cross section of the community and that all eligible citizens shall have both the opportunity and the obligation to serve. Potential jurors are randomly selected from lists of registered voters, holders of a driver's licenses or ID issued by the Division of Motor Vehicles, New York state income tax filers, recipients of unemployment insurance or family assistance, and from volunteers. The grand jury is organized pursuant to article 190 of the Criminal Procedure Law. The Court of Appeals promulgates rules for admission to practice law in New York. The New York State Education Department promulgates standards for law school education (which defer to the requirements of the Rules of the New York Court of Appeals pertaining to legal education and prerequisites to the study of law), and the New York State Board of Law Examiners administers the New York State bar examination. Attorneys are admitted to the New York bar by one of the Appellate Division departments rather than by the Court of Appeals, though once admitted to any of the Appellate Division departments the attorney is admitted to practice and appear before all New York courts, including the Court of Appeals. Applicants must be interviewed in person by a member of the Appellate Division department's Character and Fitness Committee after passing the New York State Bar Exam (the Multistate Bar Examination, and essay questions or the Multistate Performance Test) and Multistate Professional Responsibility Examination. Lawyers are regulated by various state laws, the Rules of Professional Conduct (based on the ABA Model Rules of Professional Conduct), and rules adopted by each department of the Supreme Court Appellate Division. Each department of the Appellate Division has a committee that investigates complaints of attorney misconduct and may issue reprimands or recommend censure, suspension, or disbarment to the Appellate Division. The New York State Bar Association is a voluntary bar association of New York, but others exist such the New York City Bar Association. All counties (including each of the five counties of New York City) elect a district attorney for four-year terms, whose duty it is to prosecute all crimes and offenses cognizable by the courts of the county. District attorneys are legally permitted to delegate the prosecution of petty crimes or offenses. For example, prosecutors don't normally handle New York City Criminal Court summons court cases, and the NYPD's Legal Bureau has a memorandum of understanding with the district attorneys, at least in Manhattan, allowing the NYPD to selectively prosecute them. The system of public defenders is run by county governments. Each county must provide representation by any combination of a public defender, legal aid society, and/or panel of qualified lawyers (pursuant to County Law article 18-B). For a comparison of relative activity in 2009 in New York City, legal aid societies handled 290,251 cases of which 568 went to trial, whereas 18-B lawyers represented 42,212 defendants of which 623 went to trial. The county clerk acts as clerk of the Supreme Court, Civil Branch, and commissioner of jurors for the Supreme Court for both the Civil and Criminal branches. They summon people for jury duty, keep court records, and collect revenue. They are appointed by the presiding justice of the Appellate Division of the relevant judicial department. New York State Court Officers are law enforcement officers who provide police services to the New York State Unified Court System (i.e. bailiffs), and enforce state and city laws at all facilities operated by the New York State Unified Court System. Judicial hearing officers (JHOs) adjudicate most universal summons (summons court) cases in New York City Criminal Court, assist in Criminal Court compliance parts in domestic violence cases, and in the New York Supreme Court monitor substance abuse program defendants, conduct pre-trial suppression hearings and make recommended findings of fact and law to sitting judges. JHOs are appointed by the Chief Administrator. Support magistrates hear support cases (petitions filed seeking support for a child or spouse) and paternity cases (petitions filed requesting the court to enter an order declaring someone to be the father of a child). A court attorney is a lawyer who works with and assists the judge by researching legal questions and helping to write decisions. The court attorney may also meet with the attorneys or parties to a case to try to reach an agreement without the need for a trial. New York's use of remand (pre-trial detention) and bail procedures have been criticized. For example, New York is one of only four states that does not allow judges to consider public safety when making a bail determination. And almost without exception, New York judges only set two kinds of bail at arraignment, straight cash or commercial bail bond, while other options exist such as partially secured bonds, which only require a tenth of the full amount as a down payment, and unsecured bonds, which don't require any up front payment. The Court of Appeals ruled in 1991 that most people arrested must be released if they are not arraigned within 24 hours, and in 2013, for the first time since 2001, the average time it took to arraign defendants fell below 24 hours in all five boroughs of New York City. But there have been accusations of systematic trial delays, especially with regards to the New York City stop-and-frisk program. There have also been allegations that excessive pre-trial detention and systematic trial delays are used to pressure defendants to accept plea bargains. In 2006 a commission appointed by Chief Judge Judith Kaye found that the county public defender system provided "an unconstitutional level of representation [...] impugning the fairness of New York's criminal justice system". The New York Civil Liberties Union has claimed that public defenders in New York are so overworked and overmatched that poor people essentially receive no legal aid in local criminal courts. Some watchdog groups consider Brooklyn as one of America's most corrupt judicial systems. New York's judicial nominating conventions have been criticized as opaque, brief and dominated by county party leaders. 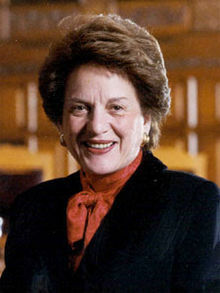 In her 1999 State of the Judiciary address, Chief Judge Judith Kaye called the system of New York trial courts "absurdly complex [...] difficult to understand, hard to navigate and a burden to administer" and endorsed a proposal for a two-tier trial court structure with a statewide Supreme Court and a series of regional district courts. Historically, county superior courts—like New York's county-by-county Supreme Court—were the highest level of trial court, overseeing a network of inferior trial courts (e.g., municipal courts, recorder's courts, courts of referees and commissioners, etc. ), the decisions of which could be appealed within the trial court system to the superior courts. The constitution of 1846 made several changes to the organization of the courts. The Court of Chancery was abolished and jurisdiction over equity was transferred to the Supreme Court. The Court for the Correction of Errors was abolished and jurisdiction over appeals was transferred to the Court of Appeals. The New York circuit courts, by the constitution of 1821, were abolished and replaced by the district benches of the Supreme Court. The Court of Appeals was established in July 1847, consisting of four statewide elected judges and four justices chosen annually from the Supreme Court. The Court of Common Pleas had been established in 1686 in New York City, extended in 1691 throughout the state, had been again restricted to New York City in 1846, and was abolished in 1895. The Court for the Trial of Impeachments was established by the New York State Constitution of 1777 and was split from the Court for the Correction of Errors upon that court's disestablishment in 1846. ^ a b c d Gibson & Manz 2004, p. 123. ^ Practice of Law 2012, pp. 9-10. ^ Gibson & Manz 2004, p. 127. ^ Constitution of the State of New York Article VI, § 10. "a. The county court is continued in each county outside the city of New York. There shall be at least one judge of the county court in each county and such number of additional judges in each county as may be provided by law. The judges shall be residents of the county and shall be chosen by the electors of the county. b. The terms of the judges of the county court shall be ten years from and including the first day of January next after their election." ^ Gibson & Manz 2004, p. 128. ^ Stonecash, Jeffrey M. (2001). Governing New York State (4th ed.). SUNY Press. p. 172. ISBN 0-7914-4888-6. LCCN 00-032955. ^ a b Local Government Handbook, p. 19. ^ "Traffic Violations Bureau". New York State Department of Motor Vehicles. Retrieved 3 August 2015. ^ a b c Birnbaum, Edward L.; Belen, Ariel E.; Grasso, Carl T. (2012). New York Trial Notebook (6th ed.). James Publishing. pp. 1–23. ISBN 1-58012-104-7. ^ a b c d Gibson & Manz 2004, p. 130. ^ a b c Gibson & Manz 2004, p. 131. ^ Judiciary Law § 140. ^ a b "Court Administration". New York State Office of Court Administration. Retrieved 1 September 2014. ^ "Court Administration - Local Administrators". New York State Office of Court Administration. Retrieved 26 December 2015. ^ a b "9th Judicial District". New York State Office of Court Administration. Retrieved 1 September 2014. ^ Miller, Roger LeRoy; Meinzinger, Mary (2013-06-25). Paralegal Today: The Legal Team at Work. West Legal Studies (6th ed.). Cengage Learning. p. 156. ISBN 9781133591078. ^ a b Gibson & Manz 2004, p. 149. ^ a b c Gibson & Manz 2004, p. 153. ^ "About the Official Reports". New York State Law Reporting Bureau. Retrieved 20 August 2014. ^ Gibson & Manz 2004, p. 155. ^ Galie & Bopst 2012, p. 161. ^ "Chief Administrative Judge A. Gail Prudenti". New York State Unified Court System. Retrieved 7 July 2015. ^ a b c Local Government Handbook, p. 21. ^ New York City Bar Association Council on Judicial Administration (March 2014). Judicial Selection Methods in the State of New York: A Guide to Understanding and Getting Involved in the Selection Process (PDF). New York City Bar Association. pp. 23–27. ^ Constitution of the State of New York Article VI, § 17. Village Law § 3-302. Town Law § 24. ^ "Court Type Descriptions". New York State Unified Court System. nycourts.gov. Retrieved 13 July 2015. ^ a b c The New York State Courts: An Introductory Guide (PDF). New York State Office of Court Administration. 2000. pp. 4–5. OCLC 68710274. ^ a b New York City Bar Association Special Committee to Encourage Judicial Service (2012). How To Become a Judge (PDF). New York City Bar Association. pp. 3–8. ^ Colby, Peter W. (1985). "The Government of New York State Today". In Colby, Peter W. (ed.). New York State Today. SUNY Press. p. 105. ISBN 0-87395-960-4. LCCN 84-8737. ^ "Judges". New York State Office of Court Administration. Retrieved 17 August 2014. ^ New York City Bar Association Council on Judicial Administration (March 2014). Judicial Selection Methods in the State of New York: A Guide to Understanding and Getting Involved in the Selection Process (PDF). New York City Bar Association. p. 13. ^ New York Constitution, Article VI, § 26. 22 NYCRR Part 33. 22 NYCRR 121. ^ a b Gibson & Manz 2004, p. 132. ^ Gibson & Manz 2004, pp. 132,134. ^ 22 NYCRR § 101.1; "There shall be an Advisory Committee on Judicial Ethics [...]"
^ New York State Unified Court System Trial Juror's Handbook (PDF). New York State Office of Court Administration. p. 1. ^ Trial Juror's Handbook, p. 2. ^ New York State Unified Court System Grand Juror's Handbook (PDF). New York State Office of Court Administration. p. 1. ^ a b Gibson & Manz 2004, p. 135. ^ NYSBA Committee on Legal Education and Admission to the Bar; NYSBA Membership Committee (September 2012). The Practice of Law in New York State: An Introduction For Newly-Admitted Attorneys (PDF). New York State Bar Association. pp. 18–19. ^ Gibson & Manz 2004, pp. 136–138. ^ "New Attorney Rules of Professional Conduct Announced" (Press release). New York Office of Court Administration. 17 December 2008. ^ Gibson & Manz 2004, p. 138. ^ a b c Apuzzo, Matt (25 September 2014). "Holder Backs Suit in New York Faulting Legal Service for Poor". The New York Times. ^ Yakin, Heather (14 October 2014). "Upstate trial could change course for defense of poor". Times Herald-Record. ^ Feuer, Alan (20 May 2011). "The Defense Can't Afford to Rest". The New York Times. ^ a b "Presiding Justice Announces the Appointment of the County Clerk of New York County" (PDF) (Press release). 24 November 2014. ^ Tolan, Casey (1 December 2014). "Justice Tingling, Who Struck Down 'Soda Ban,' Named New York County Clerk". Gotham Gazette. ^ Judiciary Law article 22. Criminal Procedure Law § 350.20, 255.20. Vehicle and Traffic Law § 1690. ^ New York County Lawyers' Association (2011). New York City Criminal Courts Manual. New York County Lawyers' Association. pp. 3, 6. ISBN 978-1-105-20162-2. ^ Ryley, Sarah; Bult, Laura; Gregorian, Dareh (4 August 2014). "Daily News analysis finds racial disparities in summonses for minor violations in 'broken windows' policing". New York Daily News. ^ NYCLA 2011, p. 6. ^ a b c "New York City Family Court -- Who's Who in the Courtroom?". New York State Office of Court Administration. Retrieved 15 August 2015. ^ a b Buettner, Russ (5 February 2013). "Top Judge Says Bail in New York Isn't Safe or Fair". The New York Times. ^ a b Pinto, Nick (25 April 2012). "Bail is Busted: How Jail Really Works". The Village Voice. ^ The Editorial Board (10 July 2015). "Trapped by New York's Bail System". The New York Times. ^ Sack, Kevin (27 March 1991). "Ruling Forces New York to Release Or Arraign Suspects in 24 Hours". The New York Times. ^ McKinley Jr., James C. (19 March 2014). "New York Courts Cut Time Between Arrest and Arraignment". The New York Times. ^ Glaberson, William (15 April 2013). "Courts in Slow Motion, Aided by the Defense". The New York Times. p. A1. ^ Glaberson, William (16 April 2013). "For 3 Years After Killing, Evidence Fades as a Suspect Sits in Jail". The New York Times. p. A1. ^ Glaberson, William (1 May 2013). "Even for Minor Crimes in Bronx, No Guarantee of Getting a Trial". The New York Times. p. A1. ^ Gonnerman, Jennifer (6 October 2014). "Before the Law". The New Yorker. ^ "Accused of Stealing a Backpack, High School Student Jailed for Nearly Three Years Without Trial". Democracy Now!. 1 October 2014. ^ Marks, Alexandra (12 August 2003). "In Brooklyn, fixing a 'corrupt' court system". Christian Science Monitor. ^ Ward, Robert B. (2006). New York State Government. Rockefeller Institute Press. pp. 140, 146. ISBN 978-1-930912-16-8. LCCN 2006050402. Galie, Peter J. (1991). The New York State Constitution: A Reference Guide. Reference Guides to the State Constitutions of the United States. ABC-CLIO. ISBN 0-313-26156-3. LCCN 90-36627. NYSBA Committee on Legal Education and Admission to the Bar; NYSBA Membership Committee (September 2012). The Practice of Law in New York State: An Introduction For Newly-Admitted Attorneys (PDF). New York State Bar Association.